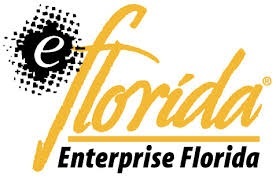 Enterprise Florida Inc. (EFI) is a public-private partnership serving as Florida’s primary organization devoted to statewide economic development. EFI accomplishes this mission by focusing on a wide range of industry sectors, including clean energy, life sciences, information technology, aviation/aerospace, homeland security/defense, financial/professional services, manufacturing and beyond. In collaboration with a statewide network of regional and local economic development organizations, EFI helps to improve Florida’s business climate, ensuring the state’s global competitiveness. Enterprise Florida is committed to assisting companies confidentially with their expansion and location plans. We provide site selection services, demographic information, incentive information, trade leads and much more. We also coordinate introductions to our network of economic development partners located throughout the state. Main office locations: Orlando – Headquarters, Tallahassee, Miami – International Trade and Business Development. International Trade & Business Development Field Offices: Seven field offices around the state provide Florida companies with export counseling services and other types of exporting assistance.